Cook bacon in a skillet until crisp. Remove bacon to a paper towel-lined plate. Reserve 1-2 tablespoons drippings and sauté onions over medium high heat until tender. Add honey and the next 4 ingredients to the skillet. Bring to a boil, stirring to combine. Remove from heat and set aside. Combine bacon, beans, and peas in the bottom of a slow cooker. Mix in the onion mixture. Cover and cook for 3-4 hours on HIGH. This is easy to convert to vegetarian by eliminating the bacon. While I recommend this as a main meal, it is a great pot luck dish to bring to a picnic or large function. 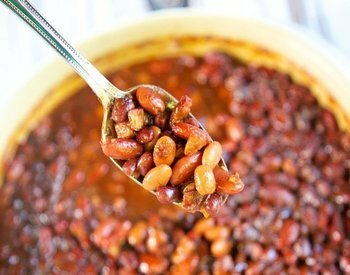 This makes a lot of baked beans so you will have leftovers for the next day. A bit unconventional, but I love to put a splash of peppery vinegar sauce on top to up the flavor factor.